Defensive fortress, castle of Cas was built in the 9th century on a site occupied by the Gallo-Romans and then through the centuries (the major part of the current Castle of Cas dates back to the thirteenth century). 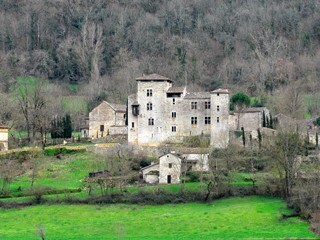 The castle was a Knights Templar Commandery of the thirteenth, fourteenth and then rebuilt in the seventeenth century, it suffered severe damage during the French Revolution. The roof of the castle was restored in the late nineteenth century. He was again sacked during the second world war and completely restored from the 80s. It owes its revival to its current owners, from a family of great morality, descendants of Claude-Marie de Lastic Saint Jal who took possession of it the eighteenth century. They decided thirty years ago, to rise from its ruins and open to the public (from April to October and by appointment). Gallo-Roman tower and French gardens, dovecote, church, fountains, hamlet, etc..